In the Ukraine, one celebrates the feast of Saint Mykola (Nicolas). This feast was introduced by the Ukrainian prince Vsevolod Yaroslavych under the papacy of Urban II (1088-1099 a.d.). On this day (not Christmas), the children receive gifts from Saint Mykola, patron saint who often comes accompanied by angels. The children who did not behave throughout the year remain without gifts (but, everyone knows the children are so sweet and tender - no one leaves empty-handed)! Today the children have come to our home to gather together in the hope of meeting with Saint Mykola. Because Saint Mykola is usually scurrying about visiting children, he is quite hard to reach. The little ones write a letter reminding him that they are anxiously awaiting his arrival as well as the gifts he will be bearing. The children sit around the table, light the candles and begin to draw. They have created beautiful pictures, illustrations drawn from vivid imaginations. The adults are not able to draw like this anymore. Once the drawings were finished, they were sent via express straight to Saint Mykola. An old Grandmother has just appeared. She tells the children how in the Ukraine people once celebrated Saint Mykola day when she was a little girl. The Grandmother recounts how Saint Mykola helped several people. She urges everyone to make a special prayer for him to keep him safe and sound. Finally, Saint Mykola makes his appearance. He arrives with two angels. There are so many gifts so the angels arrange them on a small carriage. Suddenly the terrible Devil shows up. He is carrying birch rods. The Devil claims the children should be punished rather than receive the presents intended for them. The Devil said that the children misbehaved, that all year they have disobeyed their parents: Petryk did not do his chores and Marie didn't want to study. But nobody believed him and the Devil disappeared. The children sang, recited poetry and played the piano for Saint Mykola. 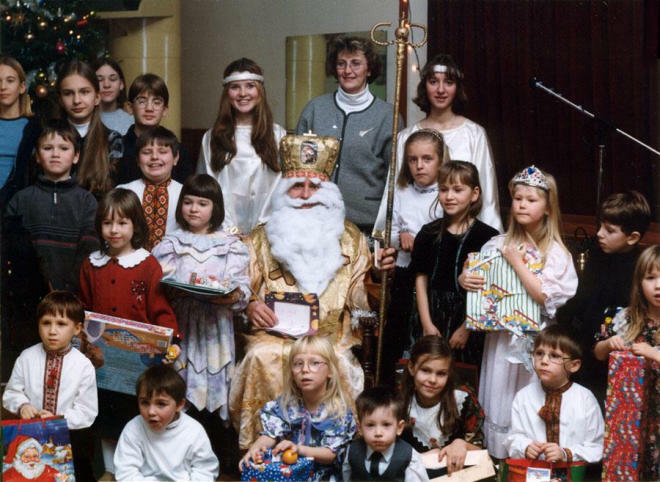 Then Saint Mykola distributed icon signets to all the children present. Apparently, he was very pleased to see how well-mannered and wholesome the children were. When the feast came to an end, all the children posed for a group snapshot with Saint Mykola - a souvenir to commemorate this special day. as well as the Ukrainian National Federation for their joint efforts in making this event a successful one.